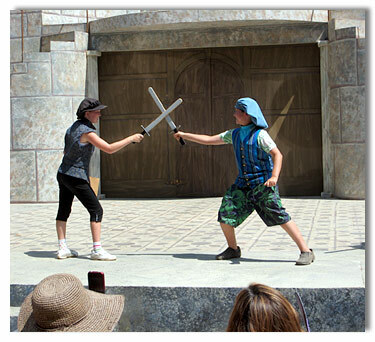 Summer Camps We make Shakespeare fun! Very young children will learn the stories and characters of Shakespeare’s plays through story-telling, creative dramatics and theatre games. One-week sessions Monday through Friday from 9 am to noon. Sign up for one session or all three! For more information, call 415/499-4487 or email education@marinshakespeare.org. We make it fun for children to explore Shakespeare’s exciting characters, language and stories. Each session culminates in a performance of an abbreviated Shakespeare play. June 17 – 28, Measure for Measure, 514 Fourth Street, San Rafael. July 8 – 19, Richard III, Marin Art and Garden Center, Ross, CA. 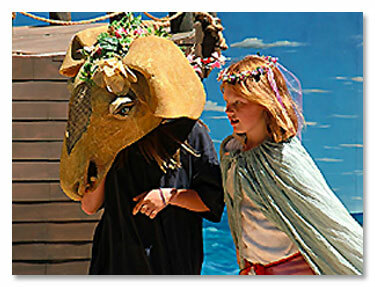 July 15 – 26, A Midsummer Night’s Dream, San Ramon Elementary School, Novato. July 22 – August 2, The Taming of the Shrew, Marin Art and Garden Center, Ross, CA. July 29 – August 9, Richard III, 514 Fourth Street, San Rafael. August 5 – 16, A Midsummer Night’s Dream, 514 Fourth Street, San Rafael. Work with a professional director to rehearse and perform Shakespeare’s complex play about morality, justice, and true love. Dig deep into Shakespeare’s language and ideas, while honing acting skills and making new friends. Mondays through Fridays from noon to 4 pm. 514 Fourth Street, San Rafael. We offer a Summer Technical Intern Program for high school students and young adults, providing training in all aspects of technical theatre. We also offer a Summer Acting Intern Program for students age 18 and older, providing professional actor training and performance opportunities.